For weeks now I've been hinting at some "Big News" I was going to share on my blog soon. And I realize as I write this post, it may not seem like big news to most of my readers who only come for fashion or crafty posts. But if you are a family member, friend, or just someone who has been following me and my family for awhile and care anything at all about our lives, it will be interesting news to you as well! Here's the "Big News": ALL THREE OF MY KIDDOS HAVE MOVED TO FLORIDA!!!!! So what brought this big move on you might ask? Well, my son-in-law Jason received a new teaching position at a private school in Orlando. We've known about the move for months, but there were so many "issues" that I don't want to go into publicly, that we decided to keep the news "low profile" until they were moved. Our daughter Ashley had developed quite a musical career in the Chicago area and unfortunately had to give up her jobs and voice students, and will now have to start all over in the Orlando area. Because she still has several gigs in Illinois that she contracted out for before the move, she will have to fly back to meet those commitments. Therefore, she is currently not looking for work in her new home until those obligations are met, but she will be networking and working on her You-Tube channel and her own music in the meantime. My son recently graduated from college and spent the summer living with us and working part time at a summer job he has had since his Freshman year. Jordan then moved with Ashley and Jason for better work opportunities than what is available in our small town. The past eleven days have been such a whirlwind of emotions due to stress, happiness, fighting (because of stress), exhaustion from lack of sleep, endless driving and traffic problems, cleaning, packing, hauling, and moving, and watching your kids start a new life together ….without you. To say I've had Hi-Lows these past days would be an understatement. But through all the difficulties, it has been amazing seeing God's hand in almost everything. I could tell you endless stories of all the people God weaved into our lives throughout this journey to help us and our children. It's absolutely mind-blowing! In fact, I think I will. Because so often we look to God only for "big miracles" or "decisions", and we overlook how He is working in our everyday lives. It all started when Jason, our son-in-law started to look for a new job. Being the bright, young collegiate that he is, he had several positions he could have chosen from. It was very difficult for them to decide what to do as many issues came into play that I can't go into here. In the end, the deciding factor was made based on what would be the most obedient to God. Once that was determined, everything fell into place like a miracle. 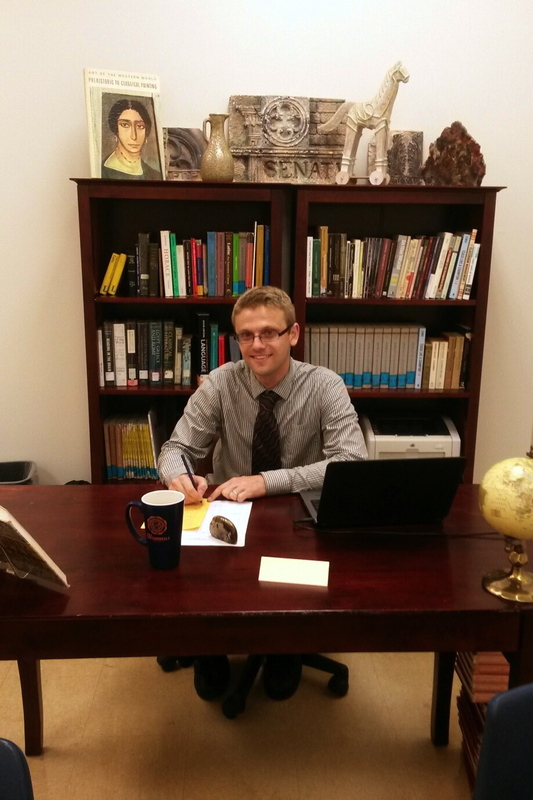 Here is Jason getting ready to teach Latin in his new classroom. The First Miracle: Finding a place to live. Ashley started searching for apartments the traditional way, but nothing great was coming her way. Then a homeowner minutes away from Jason's school contacted the school and asked if any teacher was looking for a place to rent. The school gave Ashley and Jason his number and they made contact. It turned out that this homeowner, who lives in Georgia, "just happened to be the Chicago area" and they arranged to meet at a restaurant. He is a Christian businessman that not only gave them a really great rental price on their town home, but he also prayed for them and their new journey at the conclusion of their meeting. The Second Miracle: Getting there. 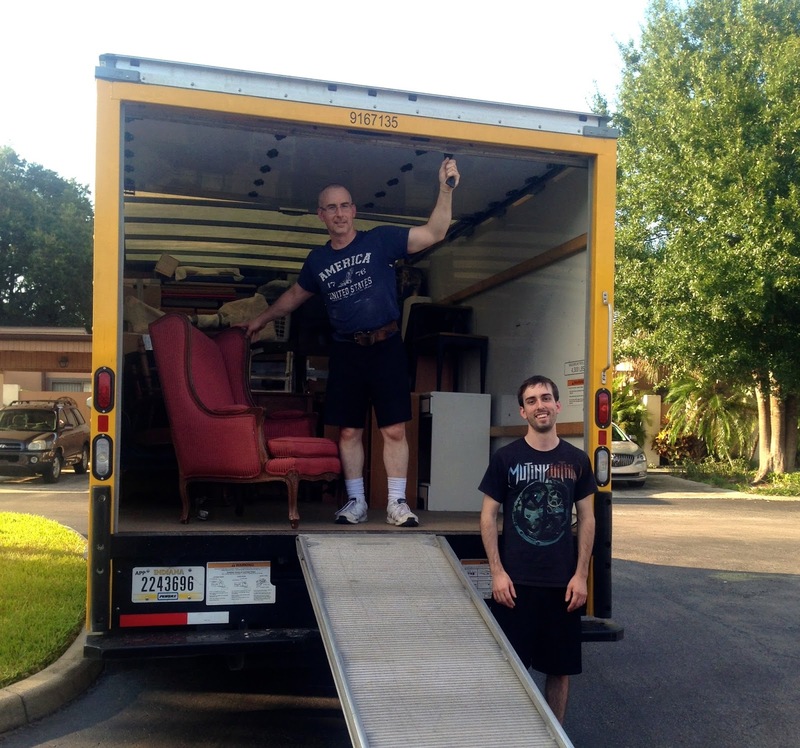 The original moving company that Ashley signed up with had doubled their moving rates for the summer. 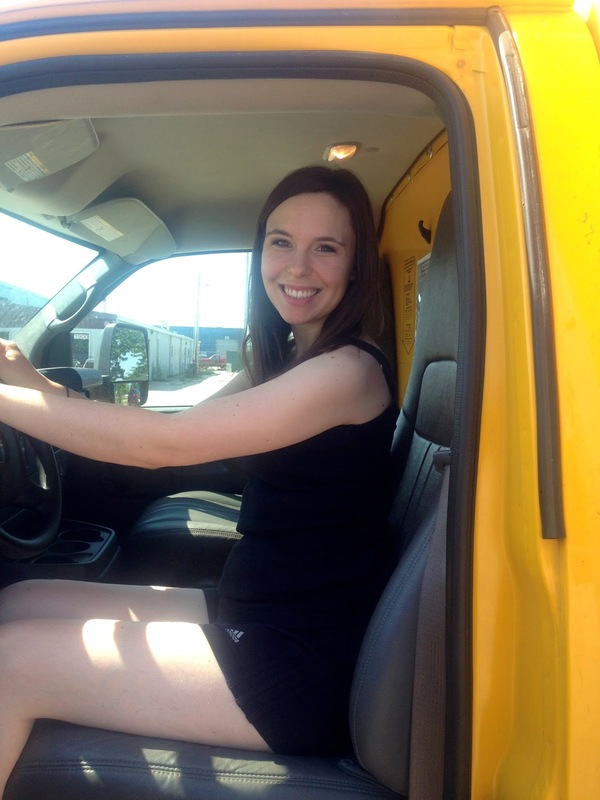 Ashley then looked into other moving trucks, and was contacted by Penske because they saw her searching on their website. They gave her an amazing deal that was even better than the first quote she got in the spring from their competitor. But now, we had a second problem. Jason had to be in Orlando on August 3rd for Teacher In-service, but Ashley had a gig in Rice Lake, WI on August 2nd that she was under contract for. Mom and Dad to the rescue! Jason drove to Florida in his car, while my husband and I picked up Ashley from her gig, brought her back to our house for a few days, then we proceeded to Chicago the following weekend to clean, pack, and load the moving van. It just happened to be the week of vacation that my husband had already scheduled. Surprise, surprise! Now, everyone knows moving is tough and hates to do it. But this move was especially tough because we were literally driving across the country in a caravan with one moving truck , two cars and four people. Ashley and I had to pick up the moving truck because my husband was still at work. You can only imagine the look on the man's face behind the counter when two little ladies show up to pick up a moving truck. You could tell he didn't see that everyday! Ashley managed to drive the truck back to her apartment while I followed behind in the car. She did very well, and only went up on a curb once because a driver didn't leave her enough room to complete her curve. The three of us, Ashley, my son Jordan, and I, did what we could by ourselves until my husband arrived. We finished up what was left to pack, cleaned the apartment, and carried all the boxes and "light" things we could manage up the steps. Then the patriarch arrived to our rescue and that man put on his weight-lifting belt and had all the heavy furniture up those steps and into the truck so fast you would have thought he was a professional moving man and not an accountant. When Ashley's friends showed up to help, they were awestruck at how much was already accomplished, and my husbands amazing packing abilities. But the next morning, the real challenge began: getting there. We knew it would be difficult keeping three vehicles together for that distance, especially since one of the vehicles didn't have a cell phone, but we never dreamed of the challenges we would face that day either. We planned on driving ten hours the first day with a sleepover at Chattanooga, Tennessee. We were suppose to arrive there at 5:00 pm and ended up not getting there until after 10:00 p.m. The initial issues were just dealing with all the tolls in the Chicago. Ashley was use to just driving through with her I-Pass, and it took awhile to figure out a quick way to get three vehicles through cash tolls and stay together at the same time. Then we had to pull over once because something got caught under my vehicle. It eventually worked it's way loose, so everything was fine. And of course me being of a certain age, I had to stop for the potty…a lot! But the real tests occurred in Louisville, Kentucky and Chattanooga, Tennessee. When we reached Louisville we got caught in the worst traffic jam I had ever been in my life. Right when we entered the city, the traffic jammed up and was being diverted off the freeway because of an accident. We were stuck in a 'parking lot' for hours. You can only imagine how hard it is to keep three vehicles together in a traffic jam when all the other cars are trying to squeeze in front of you. I kept calling Ashley on her cell phone screaming "Stay close to Daddy, stay right on his bumper, don't let anyone in!" 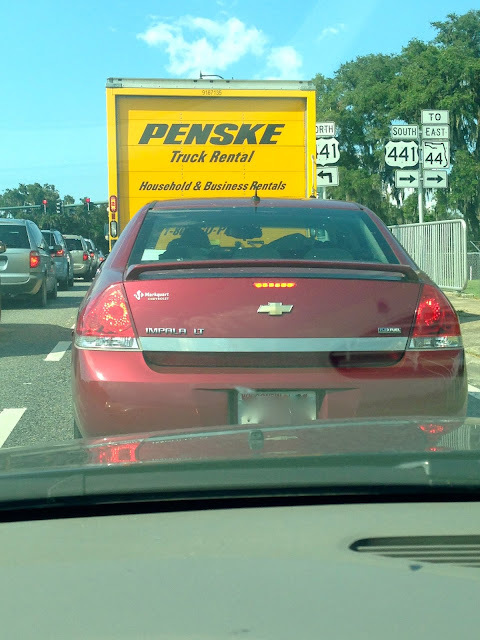 Then Ashley kept rolling down her car window to explain to other drivers that were desperately trying to cut in front of her that our three cars were trying to stay together. Thankfully, once they were told that, they all obliged. It was a nightmare. Cars were piled up everywhere. We saw cars doing U-turns down an on-ramp just to get off the highway. Then, once our turn came to finally get off the highway, other car accidents were occurring because everyone was desperately trying to get out of the city, which only resulted in more traffic jams. For example, we were in the left turn lane in the city, and my husband decided to then go straight because of an accident he could see up ahead. But because we were in the wrong lane, I almost collided with another vehicle. Thankfully, my husband and I vacationed in Louisville a year or two ago, and we were somewhat familiar with the city streets (Another God-thing in my opinion. Could you just imagine how much more chaotic it would have been had we never been there before?) and he managed to get us out and lead us back to the highway (not without hitting a sign, and going through more stop lights on accident of course). When we finally got out of Louisville and safely down the highway for awhile, my husband pulled over so we could take a break. We gathered together and talked and laughed about everything that just happened. It was one of those situations where if you don't laugh, your going to just break down and cry. So we laughed. And we thanked God for getting us through it safely. But the delay really set us back, which set us up for our next nightmare: driving down steep inclines in the dark in Tennessee. It was pitch black when we drove through the Tennessee mountains. We saw semi-trucks with their flashers on or pulled over to the side to cool their brakes. We saw warning signs of falling rock and steep inclines. We saw run-away truck ramps. And it was pitch black and we knew our fearless leader in the Penske truck could not see us and did not have a cell phone, so we had to keep up with him and not lose him no matter what. Because he is driving the truck, it wanted to fly down those mountains at a fairly high speed and he had a hard time keeping it under control. I pretty much just glided all the way down, and only braked when I felt it was absolutely necessary. I knew I was suppose to drive in a lower gear, but it was so dark, and the roads were so curvy, I didn't dare take my eyes off the wheel for a second to look for it. It seemed to take forever to get from Nashville to Chattanooga. I was so tired and tense from the drive I wanted to cry. I prayed to God to help us get through it, and to find our hotel with ease, because I didn't think there was much more we could take. If we had to drive around searching for our hotel in the dark, that would have been the end of us. I was ready to just pull my car to the side of the road and crash right there. God must have heard my prayer, because we found our hotel immediately. But of course we were all cranky and tired for none of us had eaten since lunch and we were all starving, which resulted in some squabbles. Everyone was so tired, we couldn't bear to go out for dinner. Jordan just crashed immediately, Ashley showered first, then crashed, and Todd and I soaked in the hot tub for a brief ten minutes just to soothe our aching backs, then off to bed we all went. The next day went much smoother. I don't think the hotel breakfast attendant ever saw more happier people at the breakfast buffet before….we were so excited to see food and devoured everything in sight! After breakfast, we continued on with our journey, and this day, we had no incidents…we even made it to our destination on time! However, after spending two days, over twenty four hours, looking at this view….the memory will haunt me forever! After everything we had been through in the past two days, we were the happiest people alive when we finally reached our destination. Ashley burst out of her vehicle and jumped into her husband's arms, since she hadn't seen him for over a week. And the rest of us were just so happy and thankful to God that we made it there safely. All three of us almost got into a car accident at some point in the trip. It was a miracle a car didn't break down and no one got hurt. After Jason gave us a tour of their new home, the UN-loading began. This time I didn't have to lift a finger because a troop load of teachers from Jason's new school showed up and did it all for us. They were such wonderful people and such a blessing. I don't want to show you the interior of Ashley and Jason's new home, because she wants to decorate it. She is so happy that she finally has a nice home of her own. They have lived in basements of other people's homes for most of their marriage, and this is the first time they have a really nice place. My son Jordan was overwhelmed by what God had provided for them. He has his own room, which is twice the size of the one he grew up with, and his own bathroom. They also have a cute sun room, patio, and a large pond with a fountain outside their back gate. He still can't believe that God has blessed him to be able to live in Florida and in such a nice house. This is the view from their front door and/or kitchen window. Oh, I'm so jealous! This is the pond and water feature behind their back gate. Because the house is in a gated community, they have a pool area that consists of two large pools and a children's pool, and tennis courts. We went to the pool almost everyday that we there. I can't swim a stroke, so I bought my myself a child's floatation toy and floated in bliss for hours, just soaking up the Florida sunshine. There is a building in the pool area for picnicking, showers, parties, and restrooms. Every morning before dawn my husband and I would wake before the kids and take a long walk exploring the area. We discovered so many new creatures we've never seen before like these birds. 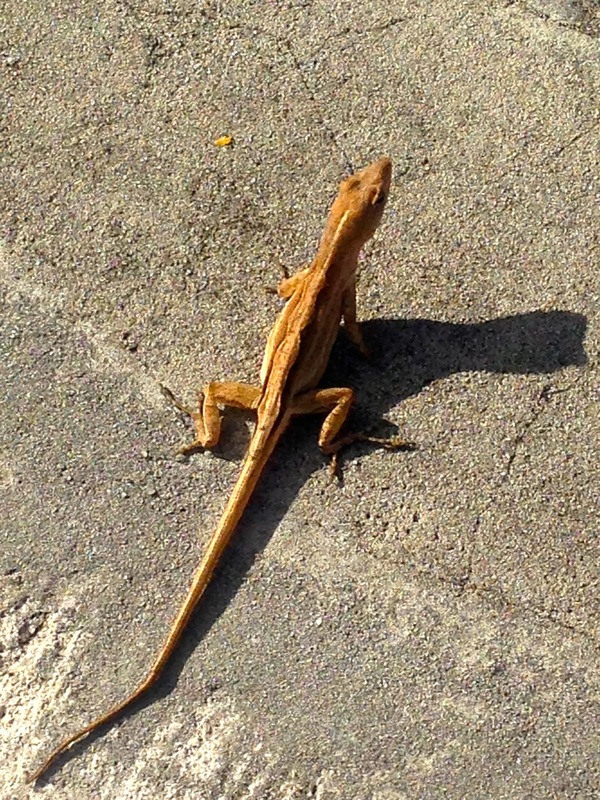 These reptiles are everywhere in Florida. They are so CUTE! They run across the sidewalk when your walking, they crawl on every surface and wall. When you first see them, they startle you. But we had gotten so use to them by the end of the week, it was commonplace. I loved discovering all the new plants and flowers Florida has, like this giant flowering cactus outside some one's home! 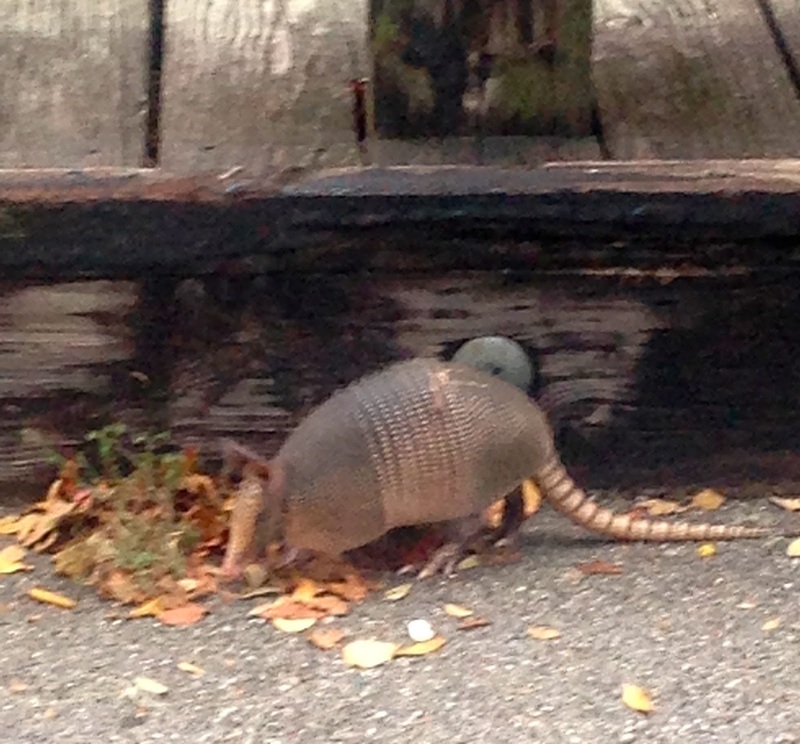 This critter we discovered while walking to Walmart. He scared me half to death! I've never seen a live one before! I've only seen them on t.v., or dead on the road while driving out west. Besides unpacking and getting familiar with the area, we spent a lot of time teaching our son "adult things" like opening up a bank account, getting car insurance, etc. We always did all these things for him before, but now that we were going to be so far away, we had to teach him how to do these things for himself. It was very overwhelming for him, but that brings us to our Third Miracle: Meeting People. The first thing we had to do was get him insured on his car since our insurance would no longer cover him because they did not service the state of Florida. So we asked Ashley's landlord if he knew a good agent that he could recommend. He then directed us to his friend Brandon, who, guess what, was a Christian! The agent was not only extremely nice and provided us with the insurance we needed, but he gave us advice on the area, recommended churches, and when he heard Jordan was interested in musical opportunities in the area, he hooked him up with his father who is also a musician and has lots of connections. Next, we went to the bank. Jordan had two banks to choose from because they were both directly across the street from his gated community. He chose the bank based on it's humble appearance, for the other bank looked "too imposing". It was at this bank where we met the lovely Juanita. Juanita is a personal banker with two boys the same age as our Jordan. She spent hours with Jordan explaining how on-line banking and debit cards work, and reassured him often that he could come and see her often anytime he had any questions. She kept saying 'how shy Jordan was' and seemed surprised that 'we were leaving him here ALONE and going back to Wisconsin'. When we were told her he would be living with his sister and brother-in-law and that he would not be alone, she seemed genuinely relieved. It was so funny. We were very thankful to God for bringing Juanita into our lives to guide our son with his finances. And that brings me to my Last Miracle: Opportunities. In addition to meeting a great insurance agent and personal banker, Jordan also got a temporary job, had an audition, and another job interview within three days of being there. There was a help wanted sign at a music store, so Jordan walked in and briefly interviewed with the manager. He was offered a seasonal job the next day helping kids rent band instruments for school. Jordan said "When I was in college studying all the band instruments and their parts, I couldn't understand why I had to learn this stuff. Now that knowledge will really come in handy with my new job". And to make this story even better, when Jordan visited a church that Sunday, guess who was up on stage playing in the band? The woman who interviewed him for the job! God works in mysterious ways! Were still praying for him to get a job teaching music lessons, to find a good group of kids to "jam with", and more musical performance opportunities. He called me on Sunday saying he found a really good church (right across the street from his gated community), and that they really showered him with attention and loved him up! As a mother, I really appreciate a church community welcoming my child when he is new to town, and I thank God for a church that made him feel so loved. So now your probably wondering how I feel about my kids being so far away from me. Well, even though my kids were only two to six hours driving distance away from me before, I still only saw them about four times a year. I will probably see them that same amount even though they are now living twenty four hours away. My husband and I plan on driving there for Thanksgiving, then they will fly to visit us at Christmas. I then will visit for a few weeks during the winter months, and they will come and visit during the summer. To be perfectly honest, I am thrilled that I now have a winter vacation home to escape to during our brutally cold winters. It is scary that they are so far away, but I take reassurance in the fact that they have each other. We also have a few family members that live in their area that we trust and know we can count on if there is an emergency. However, even though I saw God's hand in the entire moving process, and I know He will take care of them, leaving them is bitter sweet. It was pretty depressing leaving them behind in the gorgeous, sunny, warm state of Florida and head back to the cold woods of Wisconsin. As I stated to someone on Facebook "I prefer palm trees to pine trees". Our ride home was very uneventful compared to the ride there. We did stop in Georgia to pick up some Pecans at the Magnolia Plantation. 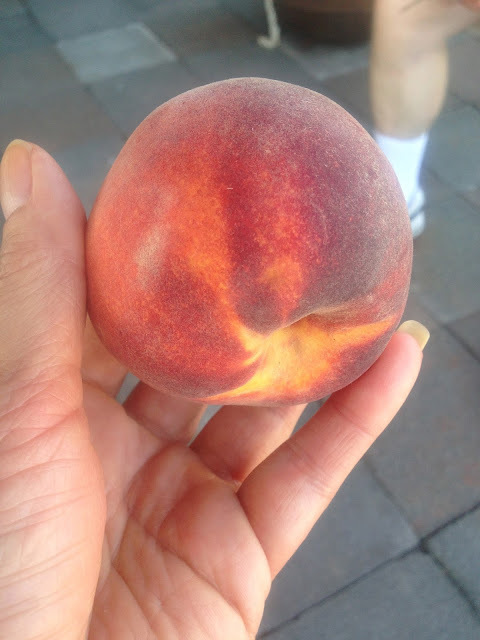 And grab some peaches at Hamlin Hills….oh, they were so good! she loves them. She responded "Hey! Who ordered my cheese fries? 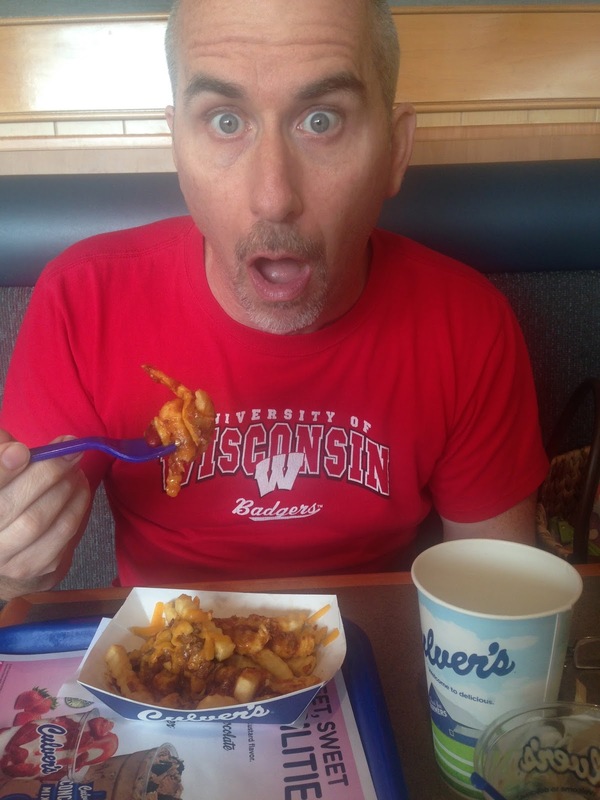 See, some things are better in Wisconsin!" I know this post was unbearably long, but I really wanted to share how God works in all the small details of our lives. So often we think our days are uneventful or that we are not doing anything significant for God because were not in full-time ministry. But God uses regular people in normal jobs to minister to others everyday. Perhaps you are the homeowner who is not ready to sell their home but you need to rent it out in the meantime. Ask God to bring into your life someone who really needs that home. Or maybe you are the insurance agent or personal banker sitting at a desk every day wondering if your job has purpose or meaning. You have no idea the lives you touch if you just make yourself available to God in the situation that you are in. Even though we thanked both Brandon and Juanita for all their help, they probably still have no idea how much they ministered to us that day. So today, as you scoot about town, running your errands and meeting people, look for the miracles that God placed in path. You will be surprised at what you find! God always works. I love seeing it and being reminded of it. How fun to have everyone in FL! What an awesome post! It helps remind me of the memories and the truths even though I was there! What adventures you all had! I could just picture things in my mind as I was reading. God is so good to provide all that we need. Thanks so much for the reminder to let God use us wherever we are! You are an awesome writer. So looking forward to seeing you soon. You've been a busy momma, Amy! So happy for all of you! You must be so proud of all your kids and their families. God is good, and this post is a perfect testimony! Hugs...! It's amazing how God works in the details. How very exciting for your family. It was great to read about all of the little blessings and now you have a great excuse to get out to Orlando!